How To Greet People – You Will Be able to impress your friends by talking about yourself in Jamaican Patwa! You’ll be able to ask people about themselves. Basics Of the Language – You’ll Learn to say basic things, About The people around you, What you are Doing & Learn What Jamaicans Call Everyday Things. You will be able to start putting together basic sentences. Talk About Shopping – With this you’ll be able to Start Talking buying things In Jamaican Patwa, As an extra bonus you’ll be able to Negotiate Better Prices when you do decide to go to Jamaica. Language Foundations – These Foundational Topics Will Help you get a better understanding of the Language & Start Speaking effectively. 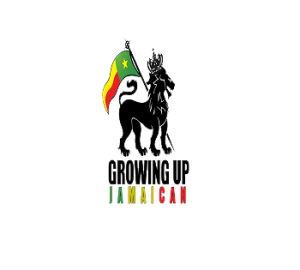 Social Life – When you complete what is in these lessons, You’ll Learn How to Go Out have fun To Jamaican Parties and make you more involved with Jamaican culture. Food – You’ll be able to talk about food. You will know Jamaican food and you will be able to order food from a Jamaican store. Talk About Life – When You Get through This section you’ll be able to talk about the world around you. Describe Buildings, And Tell People what is happening in your world. Life and Vacation – You will learn the fancy Restaurant Lingo, How Jamaicans Like things done when it comes to eating out. You’ll learn to say many things that help you go on a better vacation. Current Events – You Will Learn about How to talk about what is going on in the world around you. After You learn this, You’ll learn to talk about Current Events in the news and in the world. The World – You will learn about the world. You will be able to talk about the different countries and cultures. After You’re done, You’ll be even more able to talk about yourself to people in Jamaican Patois. Talk About Your Health – One of the most important topics to learn in ANY language. Here you’ll learn to tell people how you’re feeling. With this if something ever happens to you, You’ll know how to accurately tell people about it. 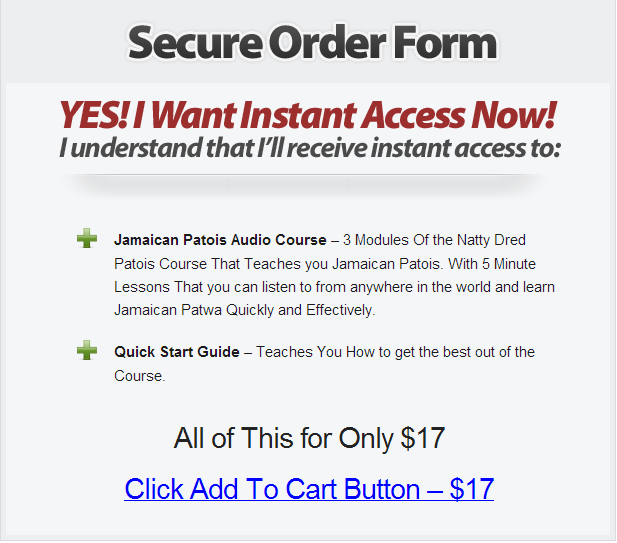 Everyday Things – After going through this Lesson, You’ll be on your way to fluency In Jamaican Patwa. This is For you If you Ever Heard a Jamaican speaking and thought “Hey!, I’d like to sound like that” Or If you were listening to Reggae, dancehall or another Jamaican song and wanted to understand the lyrics at a deeper level. If You Are Of Jamaican Descent, Living abroad and you’d like to surprise your family and connect to your Jamaican Heritage Then You’ll LOVE this Course. If You Like Jamaica & Just want to feel closer to the country, The people, The Culture then this course is for you. Know The Lyrics To Your Favorite Jamaican Song: You’ll Be able to Sing along in Patwa To Your Favorite Jamaican Songs. Enjoy Musicians Such as Bob Marley, Sizzla, Vybz Kartel, Sean Paul.. And More! Impress your friends with Your Cool Jamaican Accent:. We all know Jamaican Accent is Considered Cool and You’d have it! Connect in a Deep and Meaningful way to Jamaican Culture: You Would Get an even Deeper understanding of Jamaican and Rasta Culture. Learn a New, Fun and Exciting Culture: You’ll Finally Learn the language used by the Jamaican People. 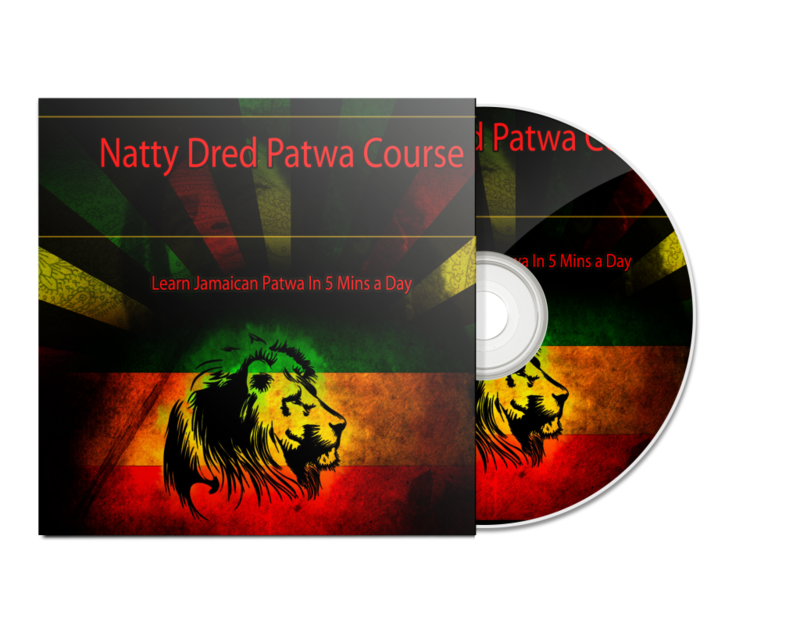 With this Course you’re going through Jamaican Culture… Its the Sweet Vybz That you’re used to. 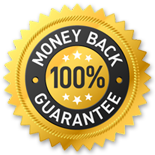 When You Order Today Our 60 Day Money Back Guarantee Means that If you do not like The Jamaican Patwa Audio Course For ANY Reason. Simple Drop us an email and we’ll happily refund 100% Of Your Order AND You get to keep the Course. When You Order, You Will Get The Download Location for the Course Instantly!